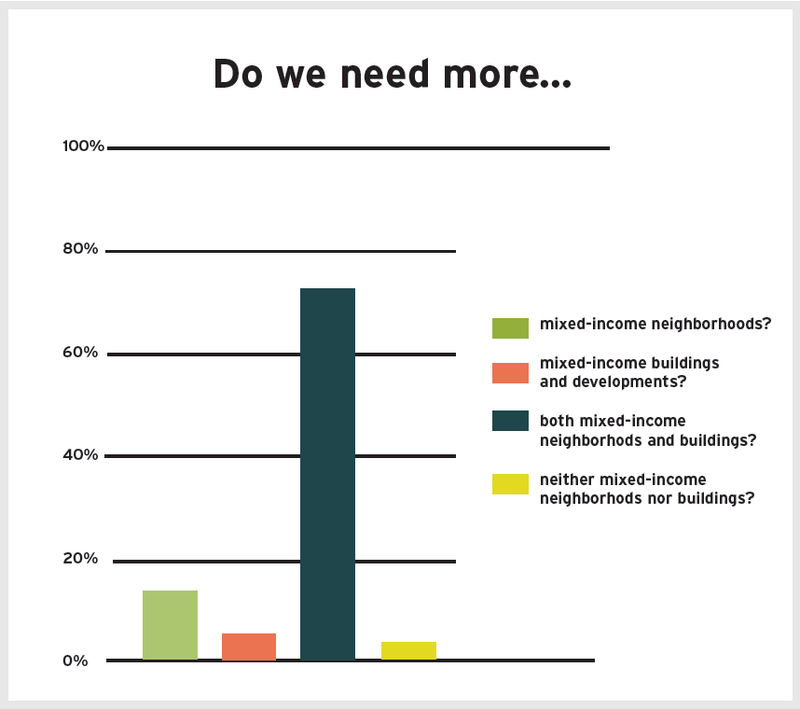 Do we need more mixed-income housing? Why or why not? The following data and observations were collected via a survey we conducted from late January through mid-February, distributed via Shelterforce Weekly and social media. Add your own thoughts in the comments below. They don’t really work to the advantage of lower-income people (the research is fairly clear on this) and they are usually used to justify the demolition/ redevelopment of affordable housing and the displacement of lower-income people. I currently live in a mixed-income apartment complex. Low-income people are still discriminated against by the complex. The maintenance crew has clearly not been keeping it as nice in the “low-income section” as they do where the “other side lives.” Low-income renters are treated with disrespect by management. Most low-income multifamily housing includes tenants from 30-60 percent AMI. This is already a very diverse population and one which often requires services that those above 60 percent do not require. Having worked in local government, it is clear that in municipalities around the country there is NO political will to mix! In fact, geography is THE tool used to segregate and reproduce inequality! While inclusionary buildings are important—especially where land costs and lack of subsidy make socially- owned housing prohibitive—they tend to have shorter terms of affordability with owners/operators not necessarily committed to or even interested in low- income residents. Suggesting mixed-income housing provides low-income children with role models is offensive. As in poor people aren’t role models? The idea of mixed-income housing is great in theory but in practice (in the South anyway) it often fails, abysmally. 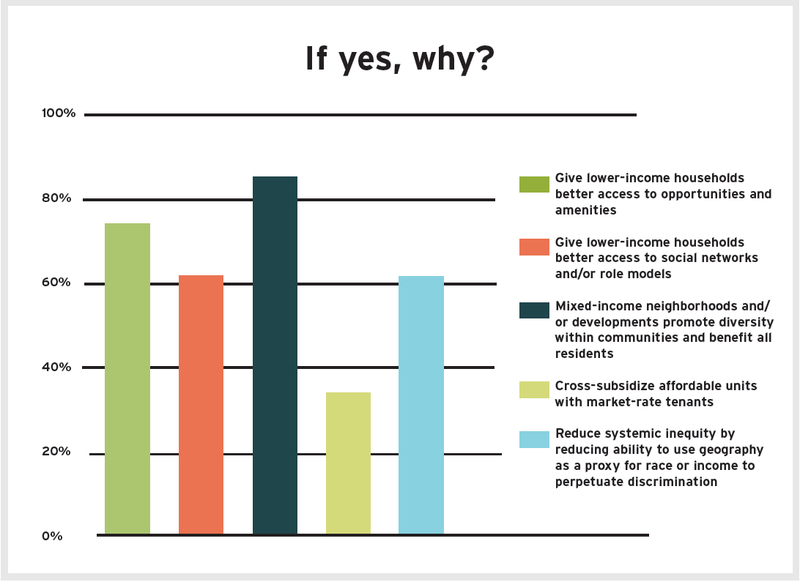 I imagine mixed-income housing is more successful in attaining the desired goals when inhabitants are racially homogeneous. If people who get a subsidy live among people who don’t, there is less chance of other people knowing their business and less chance of them feeling stigmatized. The idea is great, but with a significant decrease in available subsidy and in specific environments where gentrification is driving up values/costs, makes less subsidy deliver even less units. One possible different approach would be to focus in lower-income working- class neighborhoods where the school(s) are good. This is a subtle issue. It’s not easy to combine LIHTC and market-rate units into one complex. Funders and investors do not like such deals. Further, in many markets, the cross subsidy goes the wrong way. The affordable units must subsidize the market-rate units. Let’s focus on building affordable units in high- opportunity neighborhoods instead of mixing it up within a development. I am a small developer and take huge financial risk[s] with each development I do. If I were required to build low-income units as part of my projects I would be reluctant to do it not because I am opposed to it, but because I am being forced to build a product I know nothing about. It works as long as the interior finishes and amenities are similar. By that method, perceptions of systemic differences are not implanted when children visit neighborhood friends. They perceive differences primarily as size in dwelling footprints. This has been done successfully.